Pop-up headlights, angular shape, Turbo graphics, and a red interior. All are hallmarks of the 1980s, and this cast has them all. This here is S12 generation of the Nissan Silvia coupe, a small sporty coupe often overshadowed by later generations of this model. This casting has already been featured here before by Small Scale Sydney, so I won’t have to go into too much detail about the car or cast itself. Aside from the handbuilt 1960s first-generation, the Silvia was marketed as a competitor to the Toyota Celica, as a small sporty coupe and hatchback. As an RS-X model, this would’ve come equipped with a FJ20ET turbocharged 4-cylinder engine, the same engine as many turbocharged R30-generation Skylines. This is one of my favourite pieces in my collection, with full opening features. The hood, hatch, and doors open, plus the seats fold and recline, and there is even an opening luggage cover. The only thing is that the pop-up headlights weren’t made operable. 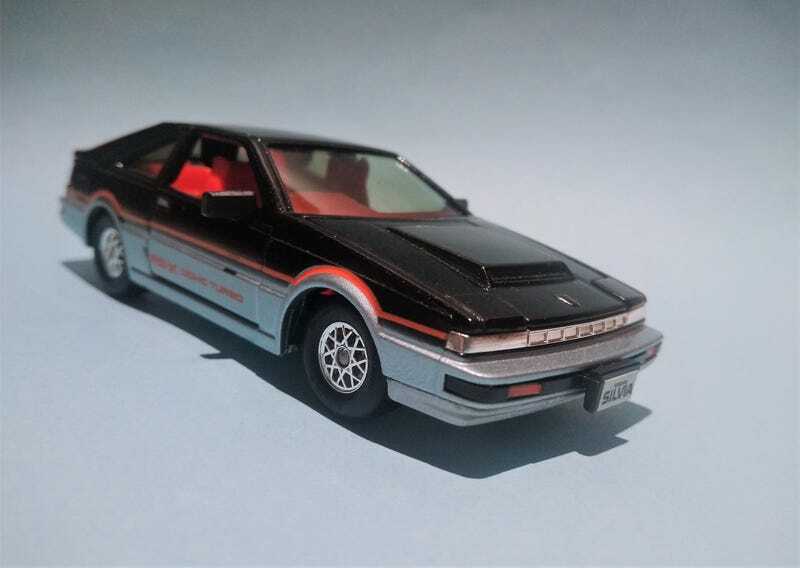 The Tomica Dandy Nissan Silvia was released in the 1980s as DJ-002, under the recently restructured lineup (DJ for passenger cars, DE for emergency, DT for trucks, etc.). This black over silver was the most common colour scheme, with a rarer white version and a highly rare red version also made. In the early 2000s, the casting was resurrected as part of the Tomica Limited S-Series. Like the Tomica Limited series, which featured upgraded regular Tomica castings, the S-Series featured upgraded Dandy castings, with realistic wheels, a factory paint scheme, and extra detailing. This example was a fairly cheap eBay find from Germany - it came near mint in box, but the inner foam tray was packed backwards, and the rubber mirror punched a hole in the back of the box. The box even has a period sticker, likely applied when retailed new, for 28.95 Deutschmarks.